While our journey took/is taking many more years than this one, it’s still familiar, still hope-filled, and still firm on how humans are NOT a commodity to be demanded but a gift to be accepted… and sometimes that gift is ourselves and needs healing. 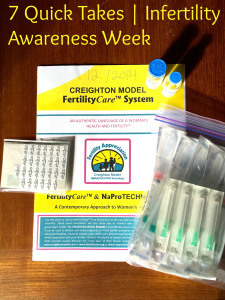 This week is Infertility Awareness week, so here are 7 quick takes on the subject of infertility. 1. When my husband and I were engaged, people would constantly ask us about kids. Our standard response was, “We’d love a two-deep football team, but we’re open to however many children God gives us.” It never occurred to me that this saying could mean that God would choose to give us FEWER children than we desired. We started Natural Family Planning during our engagement, and after a few months and a referral to a NaPro doctor, we learned that my hormone levels meant that conceiving naturally could be nearly impossible. We were told, however, that typically this type of fertility issue could be treated with hormone injections.